Thousands of small satellites, circling the globe maintaining geosynchronous orbit. Quarter sized thrusters hold these nano-boxes in place. Engineered like microchips, one thruster contains a grid of 500 needles — each a solar powered, custom-built nozzle generating ion sprays. "CubeSats" are small ( 4 in × 4 in × 4 in) satellites, launched in space, in a low-Earth orbit - as of January, 2019, there have been 1,000 cubesats launched. These devices are cheap and with newly developed 'fusion engines', they have the ability to remain in place or move to a different location. Applications range from communications to giant, space-born, billboard signs. 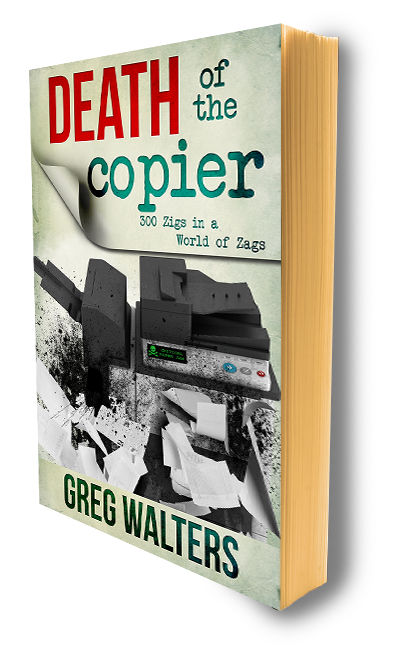 The copier industry was the vanguard of connected devices(M2M) and we should be looking for future avenues of growth. Imagine 5 or 6 or 7G connectivity speeds running on a mesh of cubesats. Imagine all things connected; plants, paint, elevators, RFID, CCTV, and yes, even one or two remaining photocopiers. Perhaps the Internet of Space is hyperbole. I'm sure there were doubters and naysayers when the first copier connected to a thing called the "network". Either way, is connectivity the 'manifest destiny' of our time?